The story revealed in this paper begins in the latest Cretaceous (ending 66 million years ago), when the world was between two greenhouse states. Climate had been cooling for tens of millions of years since the peak hothouse conditions of the mid-Cretaceous, around 90 million years ago. Despite this long-term cooling, temperatures and sea levels at the end of the Cretaceous were higher than the present day. The Atlantic Ocean was still young, and the North and South Atlantic basins were shallower and narrower than today. The equatorial gateway between South America and Africa allowed only a shallow, surface-water connection for much of the Late Cretaceous. Active volcanism formed underwater mountains and plateaus that blocked deep-water circulation. In the South Atlantic, the Walvis Ridge barrier formed above an active volcanic hotspot. This ridge was partially above sea level and formed a barrier for the flow of deep-water masses. As the Atlantic Ocean continued to open, the oceanic crust cooled and subsided. Basins became deeper and wider, and submarine plateaus and ridges sank, along with the crust. At some point, deep water from the Southern Ocean was able to pass north across the Walvis Ridge and fill the deeper parts of the Atlantic basins. From 59 million years ago onwards, Nd-isotope signatures from the North and South Atlantic fell in a narrow range. 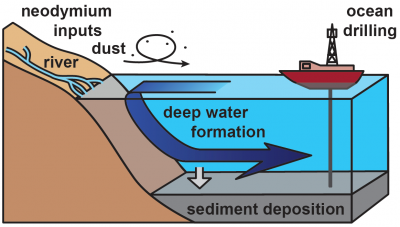 This may indicate that one deep-water mass, likely originating from the south, made its way through the Atlantic Ocean and filled the basin from deep to intermediate to depths. The enhanced deep water exchange, together with increasing atmospheric CO2, may have enabled a better distribution of heat over the planet. 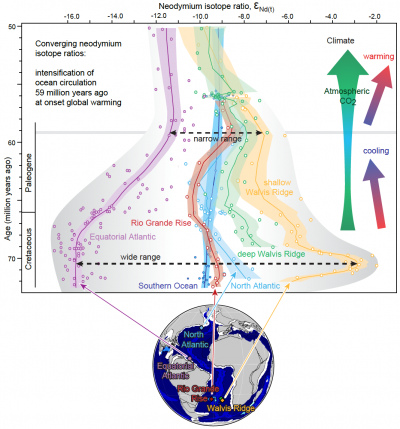 This study shows that to understand the role of ocean circulation in past greenhouse climates, it is important to disentangle geographic controls and climatic driving mechanisms. The current rate of climate change by anthropogenic CO2 emissions far surpasses the rate of warming during past greenhouse climates. 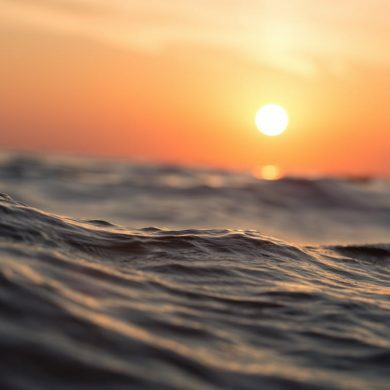 Still, studying ocean circulation during the most recent greenhouse interval in the geologic past may provide clues as to how ocean circulation might develop in the future, and how heat will be distributed over the planet by ocean currents.